Dynamo Pro Wrestling, in cooperation with Fighting for Autism, are proud to present a family-friendly professional wrestling charity event on Saturday, November 11th, 2017. This professional wrestling event will be held at the Lamborghini Gold Coast – Athletic Centre, located at 49 Lawrence Street in St. Charles, Missouri. Doors open at 6:00 P.M. with a bell time of 8:00 P.M. Ringside tickets are $30, reserved seating tickets are $20, and general admission tickets are $15. Children under the age of six are admitted free with the purchase of an adult ticket. Tickets are available at the Lamborghini Athletic Centre box office or by calling (636) 466-3766. Proceeds from this event will be used to open a new autism therapy center in St. Charles, Missouri. This new center will provide services, support, and resources to the local autism community. In addition, there will be a meet and greet prior to the event where fans will have an opportunity to get autographs and take pictures with the competitors prior to the event. Dynamo Pro Wrestling will have many of their professional wrestlers at this event, including Dynamo Pro Wrestling heavyweight champion Brandon Aarons, Brandon Espinosa, “Lights Out” Adrian Surge, Jaden Roller, Savanna Stone, and many more. The local mixed martial arts community will be represented by such mixed martial arts competitors as Jared “JDB” Daniels-Block, Steve “The Red Nosed Pitbull” Berger, Jason Powell, Chip Day, Kelly D’ Angelo, “Smashley” Ashley Cummins, “Johnny Irish” Dan O’Connor, Brandon Pearson, Marc Godeker, Adam Marburger, “The Omega Virus”, Kain Royer, “Dangerous” Danny Wright, “Wilde N’ Out”, Phil Lampe, Savin Roberts, Andrew “Mop-Jitsu” Ebers, Mike Clay, Ethan Cage, Kyle Watson, and “The Sin City Psycho” Diamond Roberts. And, in the six-man tag team main event, witness history as the hard-hitting tag team from Georgia, Generation Iron, teams with Matt Gilbert to take on Garrett “The Punisher” Holeve, Scott Lane. and Josh “TKO” Turner, cast member from AMC’s hit television series “The Walking Dead”. 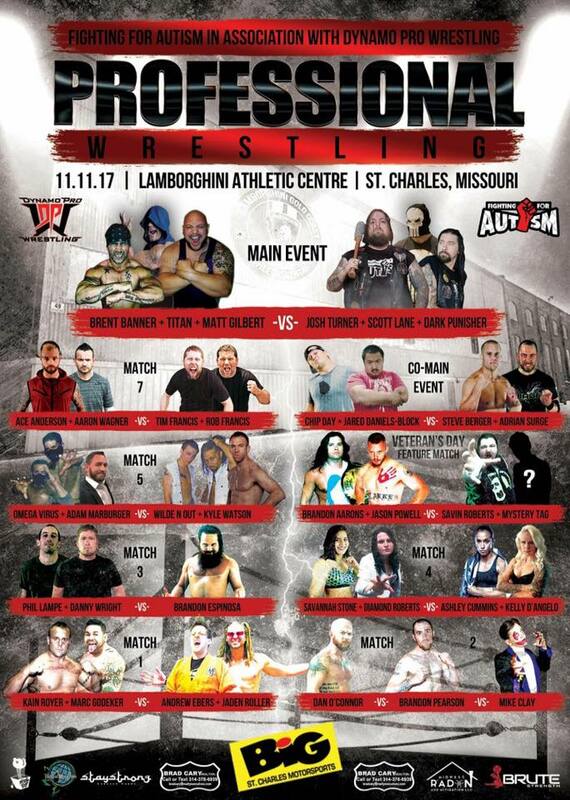 Please join us in supporting Dynamo Pro Wrestling and Fighting for Autism in helping to raise money for a new autism support center in St. Charles, Missouri. Fighting for Autism is an international autism awareness and advocacy charitable organization with operations across the US, UK, Ireland and Australia. Fighting for Autism provides various programs and initiatives supporting the autism community while being hyperfocused on a mission to fight to improve the quality of life for all children and families living with an Autism Spectrum Disorder around the world. For additional information, visit their website at http://www.fightingforautism.com.au, on Facebook at https://www.facebook.com/FightingForAutism, and on Twitter at https://twitter.com/FightForAutism. The Lamborghini Gold Coast – Athletic Centre is a multi-purpose indoor training facility for which has over 58,000 square feet of training space for various sports. For information on the Lamborghini Athletic Centre, you can check out their website at http://www.lamboathletic.com, on Facebook at http://www.facebook.com/Lamborghini-Gold-Coast-Athletic-Centre-646947422071945, and on Twitter at http://www.twitter.com/lamboathletic. This entry was posted on November 3, 2017 at 9:44 am	and is filed under Uncategorized. You can follow any responses to this entry through the RSS 2.0 feed. You can leave a response, or trackback from your own site.